ASP.NET Forums/General ASP.NET/ASP.NET Core/EF Core with an Existing Database Puy method does not work! EF Core with an Existing Database Puy method does not work! The fiddler returns me error: Bad Request with the message: Employee with id = 5 not found to update! Why? and how to solve? Re: EF Core with an Existing Database Puy method does not work! What is the value of employees.ID and id? Can you post the Employees model and the PUT message? Try using the Visual Studio debugger to validate your code. 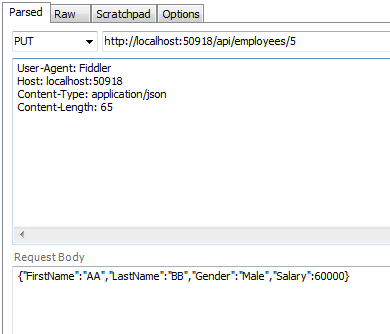 I assume the JSON in th screenshot is the Employees object? If so, the JSON object has a lowercase id while the C# code shows an all capital ID. Model Binding is case sensitive so you'll need to fix the PUT message. Also we cannot comment on code that we cannot see. Please take a moment to review your code and use the Visual Studio debugger to verify your code is functioning as you expect. I replaced "ID" to "id" in the database and all the code but still the same problem! I don't think this is the problem because when I try to delete or get one record for example using the id it is done! Again, what is the value of id and Employees.ID in the Visual Studio debugger? Delete and GET work because the id is passed in the URL. In order to keep the PascalCase use this setting in the ConfigureServices as serialization defaults to camelCase. >> Bad Request with the message: Employee with id = 5 not found to update! In addition, I suggest you put a breakpoint on “PutEmployees” and check employees.ID value which seems you did not understand from mgebhard.